Your holiday sound perfect, you have to tell me what your bff said about these leggings. I personally love them but my friend tried them in front on me last month and they were seriously awful on her. This moto is so cute, love this rich color. That moto jacket is gorgeous! And I like your justification for it, lol! Glad you and Nate had such a nice Thanksgiving! Being off social media for major sales is the BEST. I hope your Black Friday purchases work out for you! That jacket is darling and I absolutely love your thought process about it. It's basically supporting him! Your Thanksgiving sounds amazing! And you made such memories! I love your moto jacket collection. I don't think I wear mine enough since it seems to go straight from 80s to snow here! Wow, Thanksgiving on the water sounds amazing! And I absolutely love your outfit, Noelle. 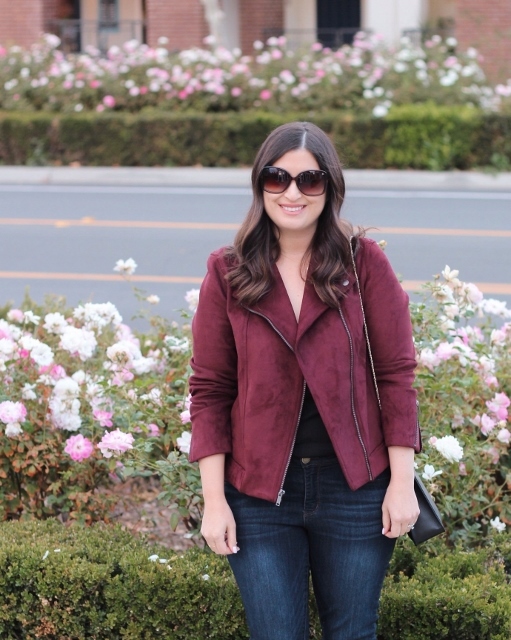 That burgundy moto jacket is so stylish!